I drew her eyes 3 years ago and swirled around them in an abstract movement which meaning I never really understood. Each time I entered my parent's home I was captivated by her look from the other side of the corridor. I always wondered what unspoken thought could hide behind her pale forehead, what mysterious secret could drive me hypnotized to the depths of her pupils. One day at home, in a sudden impulse I grabbed a random blank canvas and started to sketch my Queen again. I painted during one month. Feverishly. 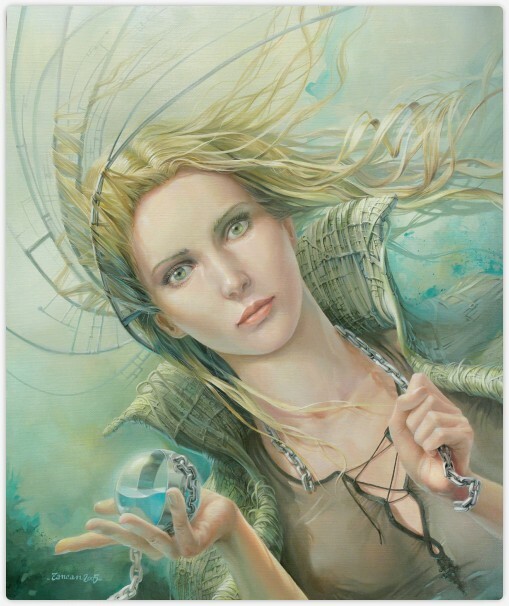 Queen of Technical Nonsense appears in the 13th edition of Spectrum, among the artworks of today's most renowned contemporary artists in the field of fantasy art.